- AJPW Budokan Hall (June 5, '89) = Doug Furnas & Dan Kroffat won the AJPW All Asia Tag-Team Titles, beating Samson Fuyuki & Toshiaki Kawada. - AJPW Budokan Hall (September 2, '89) = Furnas & Dan Kroffat retained the AJPW All Asia Tag-Team Titles, winning over Samson Fuyuki & Toshiaki Kawada. - AJPW Real World Tag League '89 (November/December) = Furnas & Dan Kroffat competed in the league, which was won by Stan Hansen & Genichiro Tenryu. - AJPW Budokan Hall (December 6, '90) = Furnas & Dan Kroffat lost to the British Bulldogs. - AJPW US/Japan Wrestling Summit (April 13, '90) = Furnas, Dan Kroffat, & Joe Malenko won over Samson Fuyuki, Toshiaki Kawada, & Tatsumi Kitihara. - AJPW Budokan Hall (March 6, '90) = Furnas, Dan Kroffat, & Joel Deaton fell to Shinichi Nakano, Giant Baba, & the Great Kabuki. - NWA Clash of the Champions XI (June 13, '90) = Furnas was beaten by Barry Windham. - NWA Great American Bash '90 (July 7) = Furnas defeated Dutch Mantel. - AJPW Budokan Hall (December 7, '90) = Furnas & Ricky Santana were taken down by Butch Masters & Giant Nitron. - AJPW Champion Carnival '91 (March/April) = Furnas competed in the league, which was won by Jumbo Tsuruta. - AJPW Budokan Hall (April 18, '91) = Furnas & Dory Funk Jr defeated Cactus Jack & Texas Terminator Hoss. - AJPW Budokan Hall (June 1, '91) = Furnas & Dan Kroffat stayed the AJPW All Asia Tag-Team Champs, beating Tsuyoshi Kikuchi & Kenta Kobashi. - AJPW Budokan Hall (September 4, '91) = Furnas & Dan Kroffat kept the AJPW All Asia Tag-Team Titles, taking down the Blackhearts. - AJPW Real World Tag League '91 (November/December) = Furnas & Dan Kroffat competed in the league, which was won by Terry Gordy & Steve Williams. - AJPW Budokan Hall (December 6, '91) = Furnas & Dan Kroffat fell to Dory Funk Jr & Al Perez. - AJPW Budokan Hall (March 4, '92) = Furnas & Dan Kroffat won over Dean & Joe Malenko. - AJPW Champion Carnival '92 (March/April) = Furnas competed in the league, which was won by Stan Hansen. - AJPW Budokan Hall (June 5, '92) = Furnas & Dan Kroffat defeated the Fantastics. - AJPW Budokan Hall (August 22, '92) = Furnas & Dan Kroffat beat Jackie Fulton & the Patriot. - AJPW 20th Anniversary Show (October 21, '92) = Furnas & Dan Kroffat lost to Abdullah the Butcher & Kamala II. - AJPW Real World Tag League '92 (November/December) = Furnas & Dan Kroffat competed in the league, which was won by Toshiaki Kawada & Mitsu Misawa. - AJPW Budokan Hall (December 4, '92) = Furnas & Dan Kroffat were beaten by the Eagle & the Patriot. - AJPW Budokan Hall (February 28, '93) = Furnas & Dan Kroffat took down the Blackhearts. - AJPW Champion Carnival '93 (March/April) = Furnas competed in the league, which was won by Stan Hansen. - AJPW Budokan Hall (June 1, '93) = Furnas & Dan Kroffat beat Kurt Beyer & Al Perez. - AJPW Budokan Hall (September 3, '93) = Furnas & Dan Kroffat won over Tracy Smothers & the Eagle. - AJPW 21st Anniversary Show (October 23, '93) = Furnas & Dan Kroffat defeated Satoru Asako & Tsuyoshi Kikuchi. - AJPW Real World Tag League '93 (November/December) = Furnas & Dan Kroffat competed in the league, which was won by Kenta Kobashi & Mitsu Misawa. - AJPW Budokan Hall (December 3, '93) = Furnas & Dan Kroffat lost to Johnny Ace & Danny Spivey. - AJPW Budokan Hall (March 5, '94) = Furnas & Dan Kroffat beat Tamon Honda & Yoshinori Ogawa. - AJPW Champion Carnival '94 (March/April) = Furnas competed in the league, which was won by Toshiaki Kawada. - AJPW Budokan Hall (April 16, '94) = Furnas & Dan Kroffat took down John Nord & the Eagle. - AJPW Budokan Hall (July 28, '94) = Furnas & Dan Kroffat fell to Jun Akiyama & Takao Omori. - SMW Night of Legends (August 5, '94) = Furnas pinned Killer Kyle. - SMW Fire On The Mountain '94 (August 6) = Furnas beat Bob Orton Jr.
- AJPW Budokan Hall (September 3, '94) = Furnas, the Eagle, & the Falcon beat Johnny Ace, Ricky Santana, & Johnny Smith. - AJPW 22nd Anniversary Show (October 22, '94) = Furnas, Johnny Ace, & Danny Spivey defeated Jun Akiyama, Tamon Honda, & Takao Omori. - AJPW Real World Tag League '94 (November/December) = Furnas & Dan Kroffat competed in the league, which was won by Kenta Kobashi & Mitsu Misawa. - AJPW Budokan Hall (December 10, '94) = Furnas & Dan Kroffat won over Satoru Akaso & Tsuyoshi Kikuchi. - AJPW Budokan Hall (March 4, '95) = Furnas & Rob Van Dam took down Ryukaku Izumida & Takao Omori. - AJPW Champion Carnival '95 (March/April) = Furnas competed in the league, which was won by Mitsu Misawa. - AJPW Budokan Hall (April 15, '95) = Furnas, Dan Kroffat, & the Eagle beat Giant Baba, Yoshinori Ogawa, & Kentaro Shiga. - AJPW Budokan Hall (June 9, '95) = Furnas & Bobby Duncum Jr lost to Johnny Ace & the Patriot. - AJPW Budokan Hall (July 24, '95) = Furnas & Dan Kroffat defeated the Wrecking Crew. - AJPW Budokan Hall (September 10, '95) = Furnas & the Fantastics were beaten by the Eagle, the Patriot, & Lacrosse. - AJPW 23rd Anniversary Show (October 25, '95) = Furnas, Dan Kroffat, & Mike Anthony fell to Johnny Ace, Johnny Smith, & the Patriot. - AJPW Real World Tag League '95 (November/December) = Furnas & Dan Kroffat competed in the league, which was won by Kenta Kobashi & Mitsu Misawa. - AJPW Budokan Hall (December 9, '95) = Furnas & Dan Kroffat lost to Abdullah the Butcher & Giant Kamala II. - AJPW Budokan Hall (March 2, '96) = Furnas & Dan Kroffat took down Bob Bradley & Rob Van Dam. - AJPW Budokan Hall (April 20, '96) = Furnas & Dan Kroffat won over Maunukea Mossman & the Patriot. - AJPW Budokan Hall (June 7, '96) = Furnas pinned Masao Inoue. - ECW Natural Born Killaz (August 24, '96) = Furnas fell to Rob Van Dam. - ECW Unlucky Lottery (September 13, '96) = Furnas & Dan Kroffat defeated Louie Spicolli & Mikey Whipwreck. - ECW When Worlds Collide II (September 14, '96) = Furnas & Dan Kroffat fought to a Draw with Rob Van Dam & Sabu. - ECW Ultimate Jeopardy '96 (October 5, '96) = Furnas lost to Louie Spicolli. - ECW High Incident (October 26, '96) = Furnas & Dan Kroffat were beaten by Rob Van Dam & Sabu. - WWF Survivor Series '96 (November 17) = Furnas, Phil LaFon, & the Godwinns won an "Elimination" Match over Owen Hart, the British Bulldog, & the New Rockers. - WWF The Triple Threat (January 31, '97) = Furnas & Phil LaFon won, via Countout, over the WWF World Tag-Team Champions, Owen Hart & the British Bulldog. - WWF Final Four (February 16, '97) = Furnas & Phil LaFon won, via DQ, over the WWF World Tag-Team Champions, Owen Hart & the British Bulldog. - WWF Wrestlemania XIII (March 23, '97) = Furnas & Phil LaFon lost a "Four Corners" Match to the Headbangers. The New Blackjacks and the Godwinns were the other participants. - ECW Fright Fight (October 31, '97) = Furnas & Phil LaFon fell to the Triple Threat (Chris Candido & Shane Douglas). 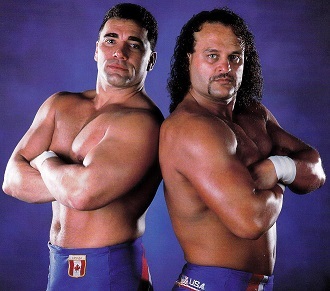 - WWF Survivor Series '97 (November 9) = Team Canada (Furnas, Phil LaFon, Jim Neidhart, & the British Bulldog) won an "Elimination" Match over Team USA (Steve Blackman, Goldust, Marc Mero, & Vader). - ECW Better Than Ever (December 6, '97) = Furnas & Phil LaFon lost the ECW World Tag-Team Titles, losing a "Three Way" Match to Chris Candido & Lance Storm. Axl Rotten & Balls Mahoney were the other participants. 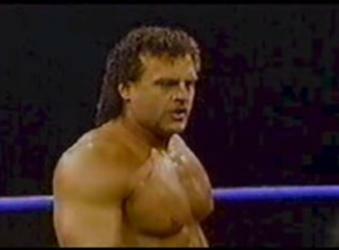 - ECW Hostile City Showdown '98 (January 31) = Furnas was beaten by Al Snow. - ECW Cyberslam '98 (February 21) = Furnas lost to Chris Chetti. - ECW Living Dangerously '98 (March 1) = Furnas fell to Masato Tanaka.